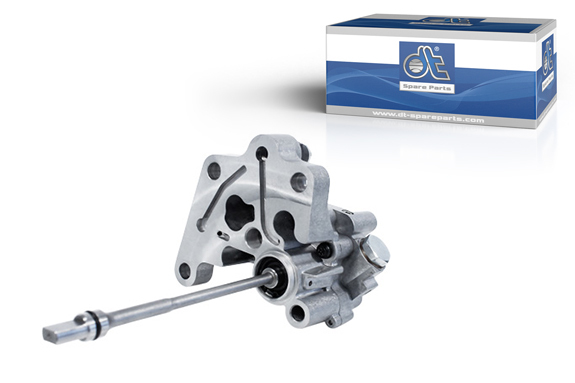 The previously used piston pumps for line injection pumps have been replaced by gear-driven feed pumps in modern common-rail engines. The fuel feed pump transports the diesel fuel from the tank to the injection pump. The feed pump is integrated into the fuel circuit and, in individual cases, equipped with a hand pump to bleed the fuel system. Gear and impeller pumps can convey between 40 and 120 litres of fuel per hour and generate a prepressure of from 2.5 to 5 bar. While piston feed pumps make the fuel available only intermittently, gear and impeller pumps provide a continuous supply of fuel. Gear and impeller pumps consist of a housing with inlet and outlet, as well as 2 gears, one of which is powered. The housing is made of die-cast aluminium. For the seals of the pump, the highly heat-resistant material FPM (Viton) is used. This is characterized by its excellent resistance to mineral oils and fuels. The sintered pump gears guarantee high dimensional accuracy and quiet operation. All DT pumps are subjected to a functionality test for pressure, leak tightness and proper flow at different speeds. The special surface finish of the valve seats and pistons provides for optimum sealing of the supply lines and prevents pressure drop. The comprehensive DT® Spare Parts range offers, in addition to gear and impeller fuel feed pumps, all piston pumps, hand pumps and prefilters.